Take a trip on the Canal de l’Ourcq in Paris: Welcome on board our river shuttles for 1 or 2 euros! For the 10 consecutive years, the river shuttles during the Eté du Canal festival are running once again on the Ourcq. This year too they will carry you away to relax, pedal, play, dance, paddle… in all, it is an invitation to celebrate summer on the canal. Every weekend from July 7th to August 26th 2018, hop on our river shuttles for 1¤ per trip on Saturdays, 2¤ per trip on Sundays with a departure every 40 minutes. These river shuttles will take you all summer long to dance balls, water parks, barges, shows and other festive entertainments during the Eté du Canal – Summer on the Canal festival. Once on board and carried along by the current, you will experience the canal differently, drifting slowly along while enjoying another side to Paris: "la Rotonde" by Nicolas Ledoux at Bassin de la Villette, the architecture of Parc de la Villette, the site of the Grands-Moulins in Pantin, the Centre National de la Danse – national Dance Centre, the East-European TGV Technicentre or the departemental parc de la Bergère in Bobigny. Get off when you want at the different stops to enjoy a party, concert and other dances or simply take in the view that passes in front of your eyes from the boat. Your journey will end at the terminus in Bobigny where a leisure port has been created for your entertainment every weekend during the summer 2018. Ticket rates for summer shuttles: 1¤ on Saturdays and 2¤ on Sundays. The trip is free for children under 10 accompanied by an adult, two children per adult. 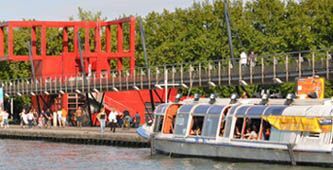 River shuttles during the Eté du Canal - Festival de l’Ourcq will sail only on Saturdays and Sundays in July and August. There are no Eté du Canal boats at this special price during the week (Monday to Friday) and off summer season on the same routes. To avoid the rush, take the shuttles between midday and 3pm for a guaranteed quite moment.